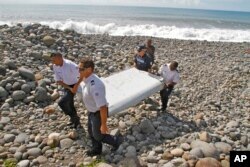 Police officers inspect metallic debris found on a beach in Saint-Denis on the French Reunion Island in the Indian Ocean on August 2, 2015, close to where a Boeing 777 wing part believed to belong to missing flight MH370 washed up last week. French and Malaysian investigators are meeting in Paris with a judge after the arrival of a wing fragment many hope will solve the mystery of missing Malaysia Airlines Flight 370. Experts are trying to determine whether the part comes from the plane, which disappeared on March 8, 2014, while en route from Kuala Lumpur to Beijing with 239 people on board. It was found on the French Indian Ocean island of Reunion and returned to the French mainland. French police officers carry a piece of debris from a plane in Saint-Andre, Reunion Island, July 29, 2015.